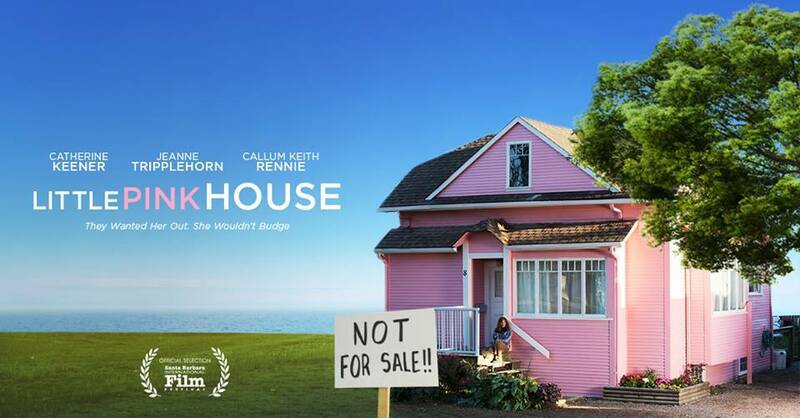 Screenwriter-director Courtney Balaker has achieved a rare feat with her recently released movie Little Pink House (based on the book of the same name). She has crafted a story about the machinery of local government without losing the creative flare that hooks an audience and engages them to the very end, all in the name of social justice. At the same time, Balaker introduces a broad audience to an esoteric yet underappreciated power of government that, in the wrong hands, can become one of the biggest threats to individual liberty. Little Pink House tells the sordid tale of how the city of New London, Connecticut, seized private homes through eminent domain to subsidize private corporate development. The actual case, Susette Kelo et al. vs City of New London et al., set off a firestorm of controversy as legislatures across the nation adopted legislative reforms to limit its use. The movie opens with local paramedic Susette Kelo (Catherine Keener, Get Out, Captain Phillips, Being John Malkovich) leaving her alcoholic husband. Depressed and unhappily single again at middle age, Kelo’s life takes a turn for the better when she buys and renovates a small cottage with a waterfront view in the run-down Fort Trumbull neighborhood of New London. Meanwhile, the state’s Republican governor (Aaron Douglas, Battlestar Galactica, The Monster) needs a political win to show he cares about unemployment and jobs in his run-up for re-election. He finds a willing ally in liberal politico Charlotte Wells (Jeanne Tripplehorn, Criminal Minds, The Firm, Basic Instinct), a college president who is also well connected in New London. The governor appoints Wells as director of the legally independent New London Development Corporation with the goal of promoting jobs and land redevelopment in the economically depressed city. The state and the city are soon courting pharmaceutical giant Pfizer. The corporation is considering a major expansion as a result of booming sales from a break-through drug. They lure Pfizer and its promise of new jobs using tax breaks and guarantees of free land. New London’s development corporation begins buying up property for the project, but some homeowners don’t want to sell. They, like Susette Kelo, have invested their hearts and souls in their modest homes and property, and don’t want to move. Ultimately, New London decides to condemn the houses and begin legal proceedings to seize them and evict their residents, using eminent domain. Kelo and fifteen other homeowners resist. They want to stay in their homes, regardless of the price. But the cards are stacked against them. The city has full-time staff attorneys, and few private lawyers are willing to buck city hall. Most don’t have the legal expertise to litigate the highly specialized cases even if they did. A local politician sympathetic to Kelo and her neighbors, however, convinces the public interest law firm Institute for Justice (a real organization) to take a look. Intrepid attorney Scott Bullock (Giacomo Baessato, Dark Harvest, Ally Was Screaming) convinces the firm to take the case. But it’s still a long, expensive uphill battle. Kelo and her neighbors are put on a roller coaster of litigation and court decisions that run all the way up to the U.S. Supreme Court. Little Pink House is striking in its ability to realistically portray the dynamics of economic development policy and the role eminent domain often plays in sealing the deals for private companies. Told from the heart-felt lens of the homeowners, the movie taps into the splendid acting talent of veteran actress Catherine Keener to convey the emotional pressures these cases impose on unsuspecting property owners who often become overwhelmed with the pace and complexity of the legal process. The emotional trauma is compounded by the fact most properties are owned by residents without the expertise or the resources to hire lawyers on their own. Little Pink House gives plenty of screen time to the governor and elected officials desperate for a political win. Charlotte Wells, for example, believes that the benefit of promised jobs (which never materialized in reality) justify the bulldozing of the Fort Trumbull neighborhood. While the political motives of the governor are crass, his behavior and tactics fall well within bounds of acceptable political behavior and mainstream economic development policy. If their rationalizations seem flat as they unfold on the screen, it’s because they mirror the abstract, imprecise, and seemingly flippant way elected officials often treat homeowners in these cases. Sometimes reality is more difficult to believe than fiction. While elected officials serve up platitudes about jobs and serving the poor, and corporate accountants focus on rate of return, the real-world consequences for the people in the homes that have been targeted by local public authorities can have emotionally devastating effects. Balaker’s directing and screenplay bring these emotions to the forefront, highlighting the values of freedom and liberty that are the backbone of American governance and what happens when this idealism comes face to face with the cold calculus of economic development policy. This conflict serves the purpose of the story by engaging audiences through the transformation of Suzette Kelo from an emotionally wounded woman rebounding from hard knocks in life to a reluctant grassroots leader opposing government overreach. Like other biopics of heroic blue-collar women such as environmental activist Erin Brockovich, union organizer Norma Rae, or the all-female baseball team in League of Their Own, Little Pink House is under no obligation to tell the other side with equal nuance, layer, or complexity. To her credit, Balaker keeps the story focused on Kelo’s journey and travails. Indeed, adding additional complexity to the elected officials and Charlotte Wells would have undermined the veracity of Kelo’s story and its connection to real-world events. As Little Pink House accurately shows, homeowners and their attempts to keep their homes are often seen as annoyances by elected officials and their attorneys, not homeowners defending a fundamental civil liberty to own property. Some viewers might struggle with the slow pace of the film, but this is likely a deliberate creative choice on the part of the director. The story begins with Kelo at a personal low point, and the pace complements Kelo’s point of view as her journey in Fort Trumbull begins. The mood brightens as she settles into the neighborhood. Her house becomes a symbol of her independence and resilience. Eventually, as she grows more confident, Kelo marries a devoted man (played by Callum Keith Rennie, Warcraft, Fifty Shades of Grey, Normal) and begins a professional transition to becoming a nurse. The pace picks up quickly, however, as tensions mount between the homeowners and the city’s development authority. In Contemporary Film and Economics, I devote a chapter and survey dozens of films to show the ways Hollywood fails to grapple with the tangible realities of the political process and policymaking. Little Pink House is a welcome exception. Buoyed by stellar acting by Keener, Rennie, and the rest of the cast, the movie succeeds on substance as well as artistic merit, a step forward in filling a neglected void in commercial narrative film. Disclosures: As a staff economist at Reason Foundation, I provided input into two amicus curiae (friend of the court) briefs on eminent domain, including Susette Kelo, et al., vs. City of New London, et al. I have also been retained by attorneys representing homeowners as an expert on urban redevelopment and blight in several eminent domain cases, including litigation involving the Institute for Justice. See here, here, here, here, and here for examples of my professional writing on this topic. I also worked with Little Pink House co-producer Ted Balaker prior to his entry into video and film production and the formation of Korchula Productions. We are co-authors of the public policy book The Road More Traveled: Why the Congestion Crisis Matters More Than You Think, and What We Can Do About It (Rowman & Littlefield 2006). I left employment with Reason Foundation in 2011 and currently work as a full-time faculty member at Florida State University where I am director of the DeVoe L. Moore Center, an endowed policy research center, in the College of Social Sciences and Public Policy. I have been a regular contributor to this blog as a film critic for the Independent Institute since 2016. My movie reviews can be found here and my critical process used for reviewing movies, Scoring Movies, can be found here.